January 9th, John had knee surgery to repair a torn meniscus and to complete a cadaver ACL replacement. Please note, the following images are HIPPA complient (John said I could post them, and he'll sign a consent form if you really need proof), however some may find them too graphic. Clicking on the image will open a new window with an enlarged view. John's surgery went very well. Post operative pain was brief and easily managed, and John has been avid in his follow up therapy. The hardest part of this entire process for John is forfeiting the racing season to ensure complete recovery. On a science fiction note -- we think the donor was a "nice guy" as John has managed to be "pleasant" throughout an otherwise frustrating period of recovery. We can only attribute this to the donor, much as we have seen the recipients of other donor organs and materials suddenly become killers and seers of the dead. On a more serious note, please, if you have not already added "Organ Donor" to your ID's and Living Wills, do consider it. 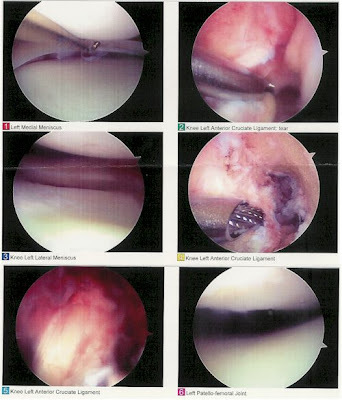 Something as simple as a ligament in your knee can significantly improve quality of life.